Ellen Joseph is a talented artist, and a friend. She and I were talking about having loved ones pass away, and the things of theirs we choose to hold onto - which inspired Ellen to write this. I thought it was lovely, and she's given me permission to share it. One of the greatest challenges we all face is the loss of a family member or close friend. After the initial stage of grief, there is the question of how to include a departed loved one in our daily lives. Cultures around the world have set up customs and rituals around the honoring and remembrance of those who've gone on, but we can create our own memorials to those who figure prominently in our hearts. The loss of my godmother nearly 2 years ago was extremely upsetting, even though I was well prepared by her years of illness. The finality of death is an emotional shock that overrides intellectual understanding. I experienced a great spiritual closeness with Aunt Kay immediately following her death and in the subsequent months. As time passed, the pain diminished, and I am left with many wonderful memories and cherished gifts she gave me. In order to include her in my daily life, I have several photos placed at eye-level at my desk so that I can feel her love beaming at me through her smile. Also in my office, I've dedicated the top shelf of my bookcase to Aunt Kay. 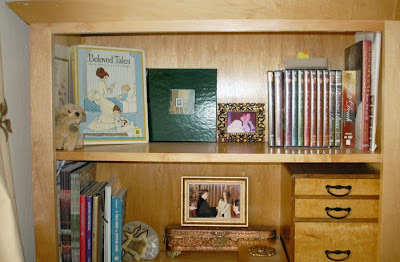 There is my favorite Beloved Tales book she gave me when I was a child, her As Time Goes By series of DVDs that we used to discuss in the years before her death, and her book about her favorite actress, Judi Dench. 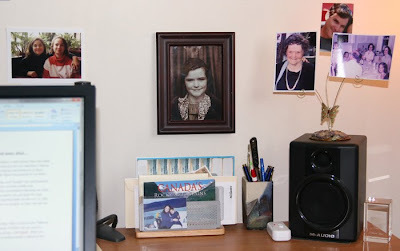 There are photos and cards I had sent to her that were returned to me, as well as a photo book I created of her memorial service on St. Patrick's Day. Prior to her death she asked me what I would like of hers and I told her I would love her set of Blue Onion dishes that meant so much to her. A large portion of the set was broken in the Northridge earthquake, but she left me what remained. Since I am an avid collector of antique china, her dishes represent the bond of a shared appreciation. I like to "start the day with Aunt Kay," serving breakfast on them when I want to remember her love. Also, when my sisters come over, we have family meals on them and always talk about Aunt Kay. All these daily reminders help me feel that Aunt Kay is never far away. 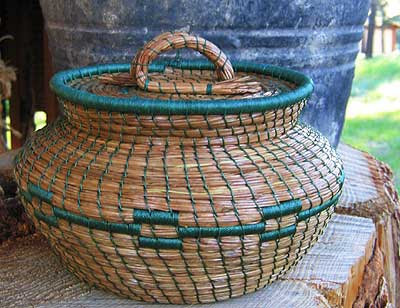 They Make Baskets from Pine Needles? 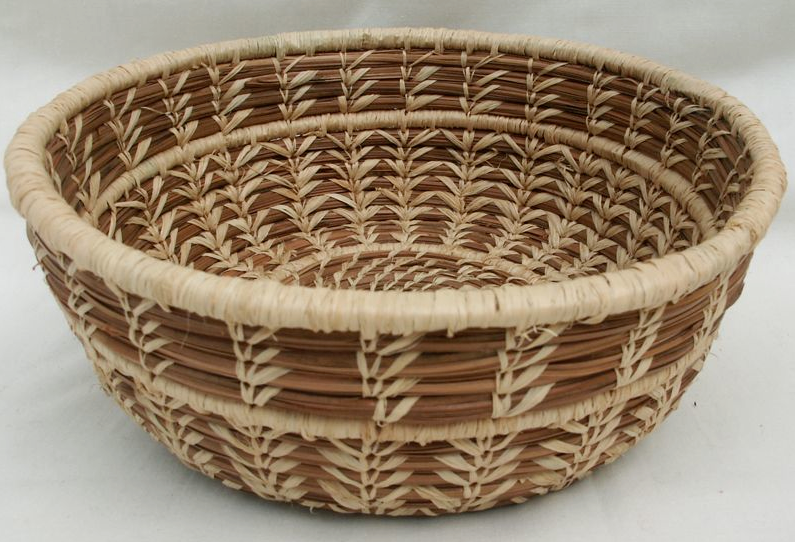 This pine needle basket comes from Sustaining Art; it's approximately 3" in diameter. 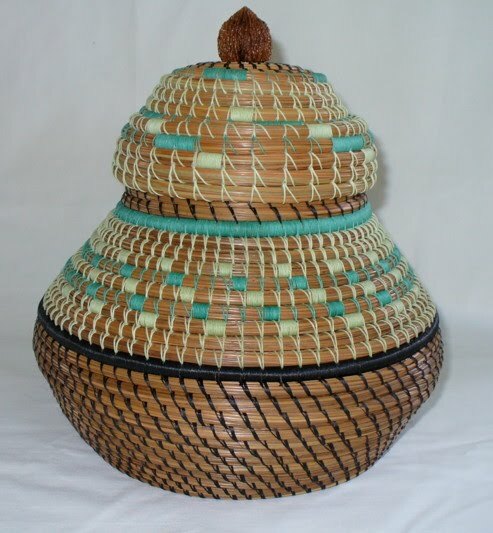 This is one of the many pine needle baskets from Funny River Trading, "handwoven using needles from Ponderosa pine trees." 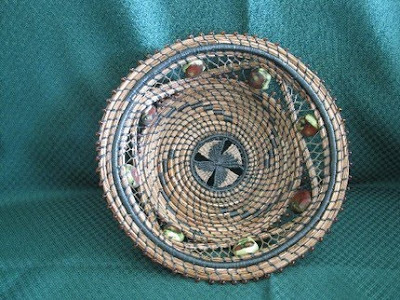 And this lovely pine needle basket, adorned with beads, come from the Etsy shop called, appropriately, Needles to Baskets. 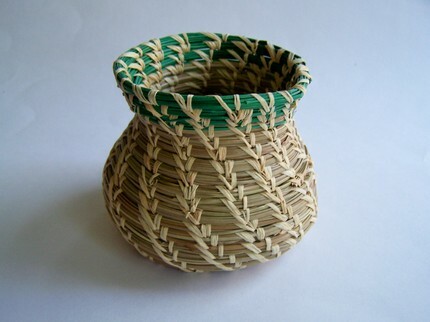 And this cute pine needle basket comes from another Etsy store, Peacox Creations. So far, all the baskets I've shown have been made in the United States - but of course, such baskets are made in other parts of the world, too. A Thread of Hope sells fair trade baskets from Guatemala, including this one. 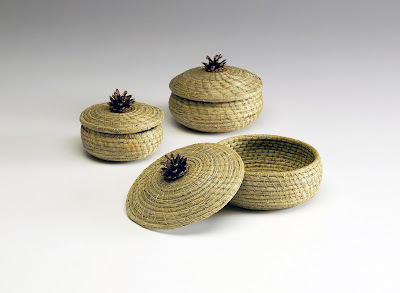 And finally, moving up north, you can get these pine needle baskets by Ojibwe artist Donna Salo from the Museum of Anthropology at The University of British Columbia. Not everything of value needs to be displayed in order to be honored. 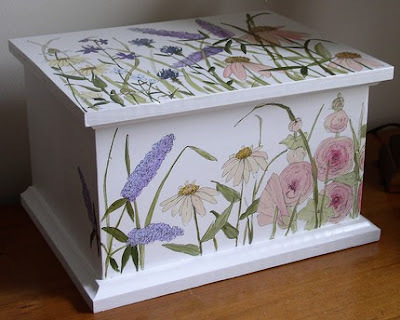 A "treasure box" that is opened periodically so that the contents can be enjoyed can be a good choice for keeping some of the sentimental stuff, too. I personally have a memory box that has things like a birthday card a college friend wrote to me on a napkin - she was a harried waitress as well as a student, and didn't get around to buying a card. 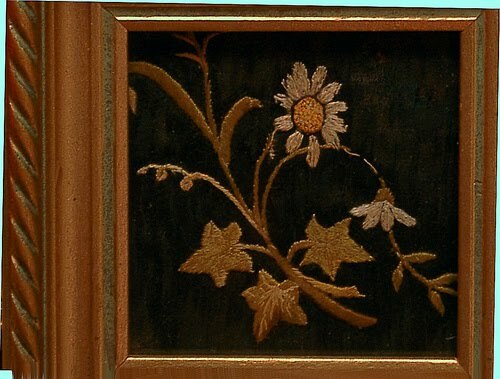 My box also includes a bit of handmade lace, now yellowed, but still precious because of the story behind it. 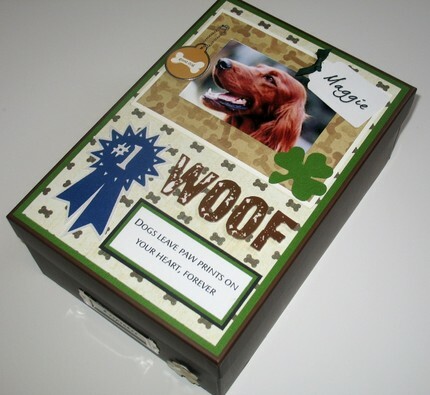 If you'd like to create a memory box - also called a keepsake box or a treasure box - you may want to invest in a box specifically designed to preserve textiles, papers, or whatever; Gaylord, Hollinger Metal Edge and Light Impressions are companies selling such boxes. I am ... "building" two small memory boxes, one for each parent - Dad's is a cigar box, Mom's another small cedar box my grandmother kept for needlework supplies. Dad's contains a few old hand tools, his shaving mug, a set of keys, his pocket knife. And, of course, a number of folks sell a wide range of memory boxes, many of whose archival qualities I can't attest to. But The Memory Keepers - which sells a wide range of customized boxes, including the one at the top of this post - indicates the company's boxes are made from "acid-free quality board." The company has boxes for weddings, graduations, vacations, and more. Baby keepsake boxes are very popular. This cute one is by Swiss Batiste; the company has a number of other designs, too. 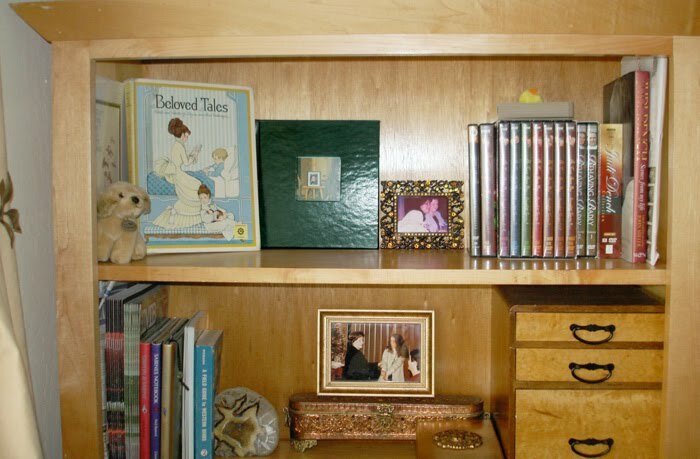 The Memory Shelf, in Australia, also has some nice memory boxes, which are "made from archival grade plastic which has been tested by the Image Permanence Institute in Rochester, New York and passed the stringent Photographic Activity Test (PAT)." 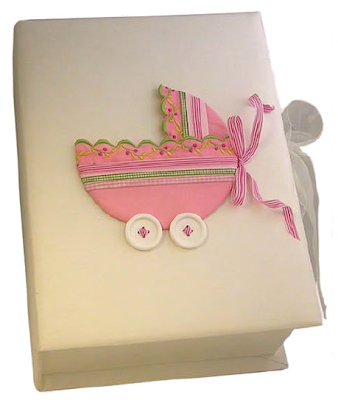 And The Memory Keepers, mentioned earlier, also has boxes with a baby theme. This memory box, from Laurie Rohner Studio (and sold on Laurie's Etsy shop) is made from pine - and painted, varnished, and waxed. And then there are the pewter treasure boxes made by Vilmain. The first one that caught my eye was the "He loves me" box sold by Uncommon Goods, but this heart-shaped treasure box looks nice, too - although the shape is less practical for storage. 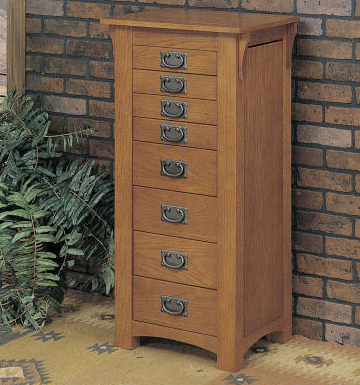 And, of course, you could use almost any type of attractive box you wanted to, and call it a "memory box." Michael Linenberger might be a best-selling author, but I found Master Your Workday Now to be a bit of a slog, at least at the start; I only finished it today because it's due at the library tomorrow! However, that doesn't mean there weren't plenty of interesting ideas. 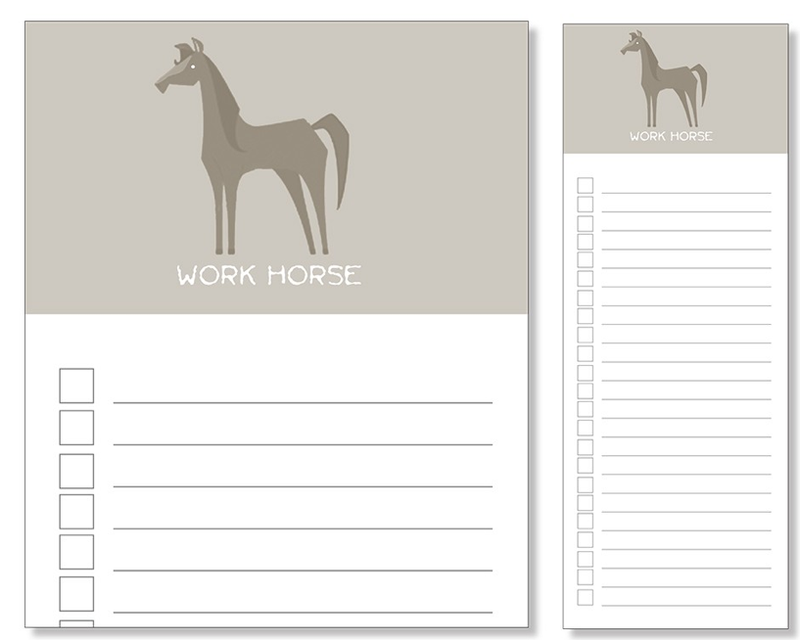 Linenberger believes that looking at a huge to do list every day is too overwhelming. Therefore, he suggests you have three lists; items are added to the different lists based on urgency, not importance. These are the must-do-today items - the things you would stay late at the office to finish. This list would rarely contain more than 5 items. These are things you want to start as the opportunity presents itself - sometime this week or next. You look at this list daily, and you want to keep it to no more than 20 items. Note: Items 1 and 2 make up the Now Tasks list, and they include only "next actions," as David Allen uses the term. So they won't be complex multipart tasks, but rather simple tasks like "Write e-mail to Client A about subject X." These are items that you can "chill out" about for right now. This list gets reviewed weekly. Well, at least that's how the concept starts out - pretty simple. But then Linenberger adds an optional Target Now section to the Opportunity Now list - this is for the items you'd really like to do today. 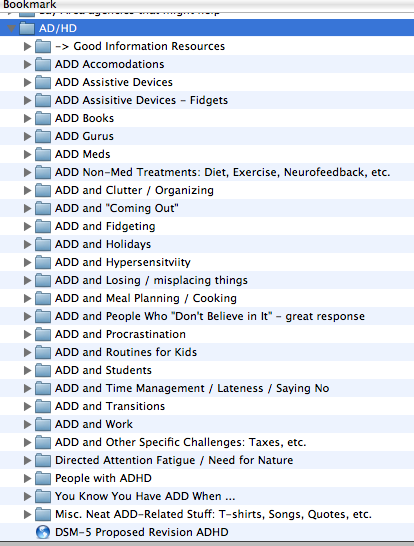 And there's a third enhancement: He adds a list of Significant Outcomes (SOCs) to the top of the Now Tasks list. These are the larger efforts - what David Allen would call projects, but which may not be "projects" as most people think of that word - that you want to complete (or make major progress on) during the week. OK, it's still not that complex - and the graphics in the book (which are also available on the web site, if you give Linenberger your e-mail address) are helpful. Linenberger does not believe in scheduling calendar time to do specific tasks, in most situations; one exception could be if a task is going to take a chunk of time, and the deadline is looming. But if you're not finding enough time to work on tasks during normal business hours, he suggests adding a one- to two-hour appointment with yourself, just called Tasks, to your calendar each day. What about tasks you've delegated? 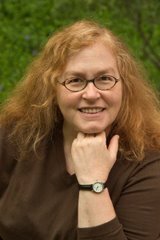 Rather than having a Waiting For list, Linenberger creates tasks for doing follow-up activities, and places them on the appropriate lists. I just received a fantastic raise of 25 percent. That means I can now buy that convertible I have been longing for - I can see myself now, driving down the coast, the sun in my face, the wind in my hair,. What a sweet experience this is! I am also going out to dinner every weekend - I love great food. But other sample goals, also dealing with money, focus on other benefits: security, freedom, etc. And Linenberger also gives examples of goals dealing with things like losing weight. Linenberger then has you "activate" your goals through "positive visualization" - you "spend a few minutes each day reading and visioning" those goals. And finally, in Part III, Linenberger talks about "connecting your work with who you really are" - connecting with a larger vision, with your own intuition, with your (current) life's work, and with your personal mission. In both this section and the one on goals, Linenberger writes extensively about the power of the subconscious. Throughout this book, Linenberger acknowledges being influenced by many other thinkers, and there's an extensive resource listing at the end of the book. Does any of this resonate with you? Has anyone tried any of these approaches? I'd love to hear your thoughts! When Lifehacker asked its readers about the best to-do list manager, paper got 23% of the vote - and this is from a techie-oriented crowd. If you're one of those who prefers paper - and you'd like something a bit special to write your list on - I've got some products to show you. 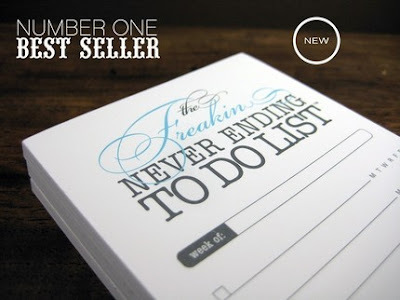 The one above - The Freakin Never Ending To Do List - comes from Erin Vale's Etsy shop, finch&hawk. You can also take a look at her no-cost printable HoneyDew list. 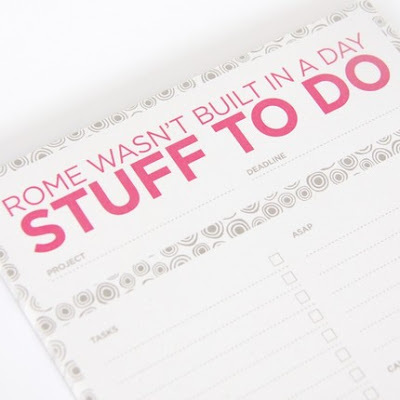 You might also like modernmotive's Rome Wasn't Built in a Day: Stuff To Do List. While designed for projects, it seems like it could work well for general-purpose to do lists, also. And it's printed on eco-friendly paper. 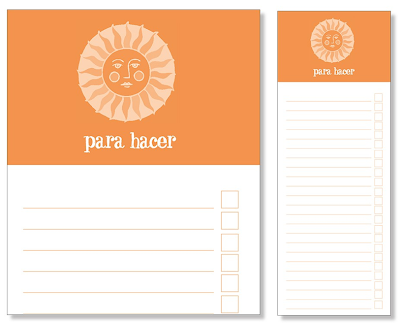 Then there's Skel Design - with so many nice to do notepads that it's hard to pick just one to show you. Here's one in Spanish; there's a also a French version. And here's one of Skel Design's to do notepads with an animal theme. There are also pads with frogs (jump to it), dogs and cows. All the pads are made with 100% post-consumer recycled paper. Organizer Geralin Thomas of Metropolitan Organizing - one of the professional organizers on the TV show Hoarders - asked me how I get organized to research and write my blog posts. If you'd like to read my answer, check out my guest post on her blog. Today, I'm going to focus on the whole idea of honoring those items we choose to save. Many of my fellow organizers have addressed this subject, and I'd like to share their wisdom. My clients can keep whatever they want. ... However, I do expect them to know what they have, be able to find what they keep, and to honor the memories in their lives. I tell them a memory isn’t a memory if it’s in a dark corner of the closet or in a box in the basement - it’s just stuff. So, we work on honoring those memories and not personifying the object. I’ll offer ideas, such as photographing the quilt grandma made in 1960. You know the one - it’s Harvest Gold, has holes from moths, and is so scratchy you’ll never use it. ... The visual of the blanket is what the client wants to hold on to, not the scratchy blanket. And organizer Aby Garvey shares a way that someone displayed her dad's old fishing lures and bobbers. 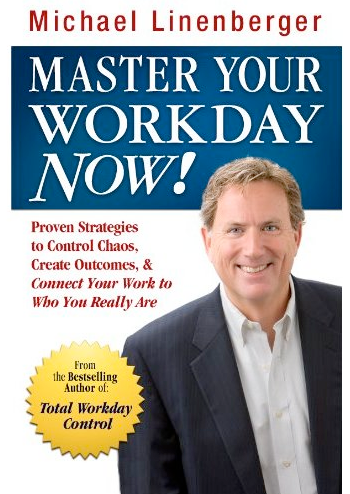 Want to know how the former Chief Information Officer of Google organizes information? That would be a good reason to read Getting Organized in the Google Era: How to get stuff out of your head, find it when you need it, and get it done right. 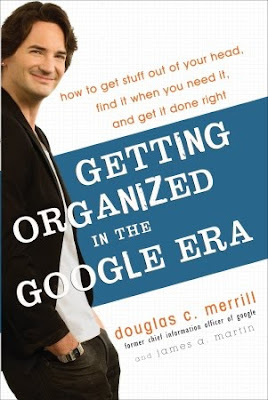 While I generally agreed with author Douglas Merrill's organizing principles, I didn't see much new here. "Get stuff out of your head as quickly as possible" is good advice - and something David Allen has been saying for years. "Multitasking can make you less efficient" - sure, but that's old news. What I found most interesting was this one principle: "Don't organize your information; search for it." Again, this isn't exactly a new idea - and you may or may not choose to rely on search as much as Merrill does. Will you be more efficient if you give up filing computer documents and e-mail messages into folders? It's your call. But those of us who grew up filing need to heed Merrill's words: "Just because something's always been done a certain way doesn't mean it should be." We have much better search tools than we used to have - and if we learn to use them well, moving away from filing is certainly a viable option. I haven't given up my computer file folders yet, but it's something I'm continually evaluating as a possible change to make. Merrill encourages us to "try to make search a forethought, not an afterthought." In part, this means following this principle: "Add relevant keywords to your digital information so you can easily find it later." It also means selecting tools that support the use of search. Merrill also uses Gmail in ways that might surprise you. I haven't used Evernote, or Microsoft's OneNote, but I know people who use these programs for storing all sorts of information, and rave about them. 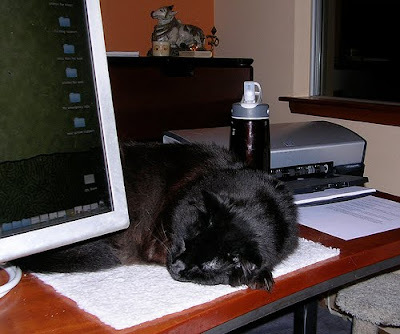 Merrill uses Gmail in much the same way; it serves as his content management system. He mails himself "scraps of digital information," including information found online, because "web pages can be ephemeral." If he gets or creates a PDF of an important document, he mails it to himself with a reminder as to where he filed the original paper document. Last night, someone asked me about TV lifts - and I said sure, I could point him to some nice-looking options. I've written about these lifts before, but three more options have come to my attention since then. One of these is Import Advantage, which sells TV lift cabinets in a range of styles. Another company whose TV lift furniture caught my eye was Changing Wood, in the U.K.
And then there's this spectacular showcase / TV cabinet from Andrew Pitts, FurnitureMaker. I'd never have guessed this piece conceals a TV lift - but there's a picture of it on his web site! You can see another lovely piece by Pitts on CustomMade, where I first found his work. I've seen many a person with an old computer or two languishing in the garage, the desk drawers, and the far reaches of a closet. If you'd like to clear up the old-computer clutter, here are some options. Sure, you could use craigslist or eBay. But you could also consider services like Gazelle (PCs and Macs) or BuyMyTronics (Macs only) - where you have a guaranteed right-now sale. Simply describe your computer - filling out the online forms - and Gazelle and BuyMyTronics will tell you what they'll pay for it. Both services pay the shipping, so the price quoted is what you'll actually get. 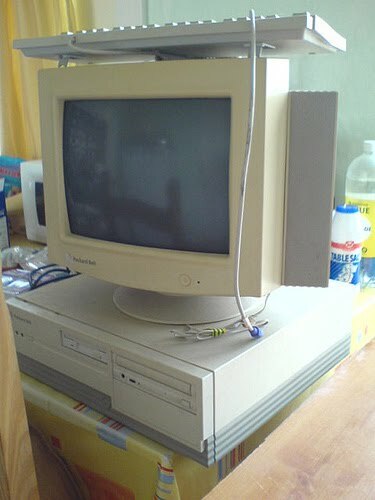 Of course, not all old computers will have any cash value. But it's quick and easy to find out if yours does. 2. Use the manufacturer's take-back program. Sometimes you can get money this way, too - although the programs vary widely. Look at the reuse and recycling programs offered by Acer, Apple, Dell, Gateway, HP, IBM, Sony and Toshiba. Goodwill Industries encourages businesses and individuals to donate their new and used computers. Since 2004, Goodwill Industries and Dell, Inc. have worked together to responsibly recycle unwanted electronics at no cost to the public. To date, the Reconnect partnership has collected more than 96 million pounds of electronics. Simply take your unwanted electronics — any brand, any condition — to a participating Goodwill store or donation drop-off site. Goodwill will refurbish or recycle the equipment, benefiting communities and putting people to work. But Goodwill certainly isn't the only option; other organizations also accept computer donations - for good causes. Some examples are the Computer Recycling Center (San Francisco Bay Area), Computers for Schools (Chicago), Computers for Children (New York), the Cristina Foundation (Greenwich, Connecticut), World Computer Exchange (Hull, Massachusetts) and Computer Aid International (London). Each program has its own guidelines as to exactly what can be donated. You might also choose to give your computer away on craigslist or Freecycle; people may want even non-working computers for the parts that do work. Given the other options above - and that recyclers often charge a fee - this may be the last choice. But it sure beats putting computers - with all their hazardous waste - into the garbage. If you go this route, you'll want to find a responsible recycler. Special note for "vintage" computers: Certain old (and rare) computers might be worth a substantial amount of money. Others would be appreciated by places like the Computer History Museum and the Vintage Computer Festival. Keeping your data private: While many buy-back, donation and recycling programs promise to wipe all personal data off your computer, you may feel more comfortable doing this yourself. Find instructions on the internet or check with your computer consultant if you're not sure how best to do this. If the computer won't even boot up, some people choose to solve the data-privacy problem by removing the hard drive and physically destroying it. 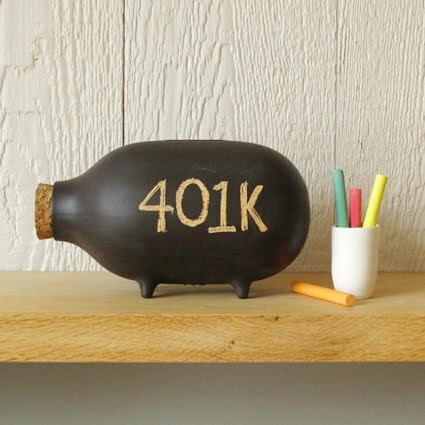 I've seen many a cute piggy bank, and I'm pleased to have found even more - including the Chalk It To Me piggy bank. 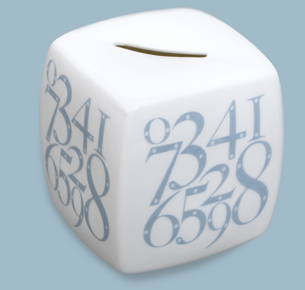 This ceramic bank even comes with chalk and a cloth wipe! [via Swiss Miss] Update on Oct. 17, 2014: I'm no longer finding this bank. I'm not a video game fan, so I'd never heard of Monster Hunter until I came across the Monster Hunter piggy banks, and got curious. But who needs to know about the game? 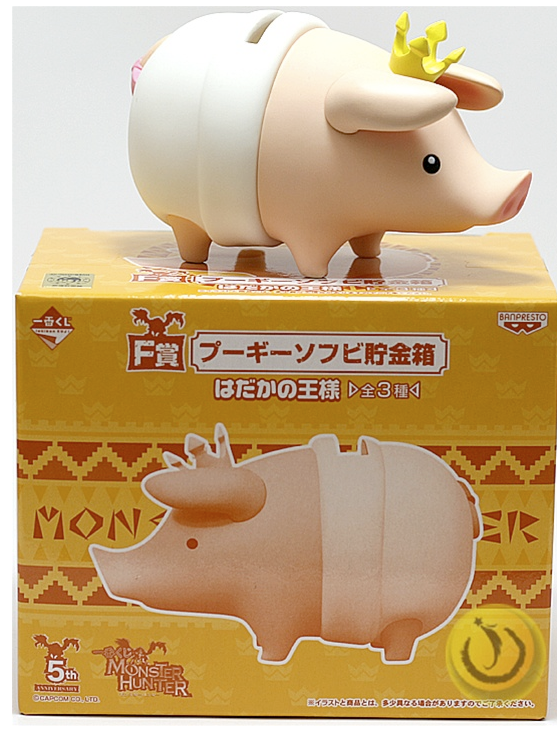 The banks - this king pig, and the sheep pig - are just darn cute. Update on July 9, 2012: I'm no longer finding these. There are some lovely banks made for young children - but who says their use has to be limited to kids? Mini Moderns has four different bone china money boxes. [via Babygadget] Update on July 9, 2012: I'm not finding this one any more. 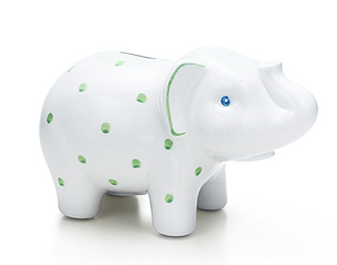 And Tiffany has banks in the form of pigs, bunnies, and elephants. For something oriented to adults, take a look at the handmade piggy banks by Suzanne Crane, which seem to combine "cute" and "lovely." They're available in seven different glaze/trim color combinations. 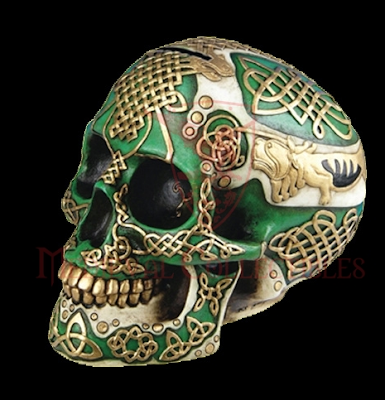 Finally, for something really out of the ordinary, take a look at the skull banks from Medieval Collectibles. People taking vacation at beaches sometimes bring home shells or sea glass they found along those beaches. But what happens to those shells or that glass after the trip is over? 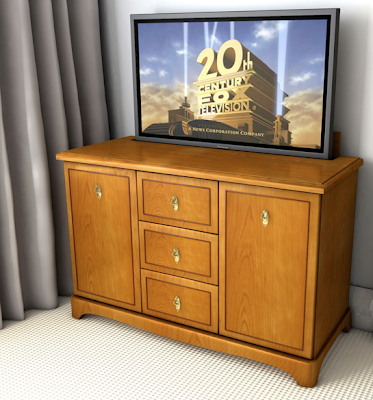 All too often these items get shoved in a bag or box, and are never seen again. Why not really enjoy these mementos of your travels? Option 1: You could make a lovely display of some of your shells and/or glass. Lallee on Flickr has a nice example. And Eliza has ideas on how you can use your sea glass. Option 2: You could have some stunning jewelry made. 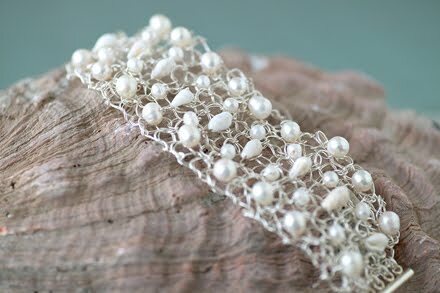 Stephanie of Stephanie Hamilton Designs could knit you up something very special - see the bracelet above for just one example! The shells in this piece came from one of the free shell leis you get at Hilo Hattie. I have thousands and thousands of bookmarks - I don't know exactly how many, but they take up 9 MB on my computer. (If you're using Internet Explorer, my bookmarks are the equivalent of your favorites.) I come across many web sites that seem useful for either for work - including this blog - or for my own personal reasons. But I've just spent a few hours decluttering and organizing them - and wow, does that feel good. I'm only about half done, but its already much easier to find what I'm looking for. 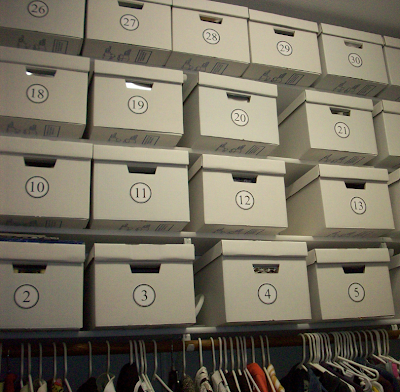 The types of activities I needed to do for this project are very similar to those needed in other organizing projects: deciding what to keep, grouping like with like and deciding where to keep those groupings, and labeling. In some cases, I got rid of large collections of bookmarks. Example: Since I've been a self-employed organizer for over five and a half years now, I figured I'm really not going back into the corporate world, working in an Information Technology department. So I really had no need for all those bookmarks having to do with software engineering. I'd gotten rid of the books on such topics years ago, but had somehow neglected to clear out the computer files. I also got rid of bookmarks if I could readily find the same information again in a single Google search. Why do I need to bookmark Car Talk, for example - no matter how much I enjoy that radio show? And then there was the outdated information. I had bookmarked information about specific cars I was considering from a few years ago, when I was buying my Prius (after my prior car - my wonderful Toyota MR2 - finally needed to be replaced, at 280,000 miles). But I won't need car reviews again for many years - and certainly not the ones I had! Sometimes I would glance a bookmark and really not know whether I wanted to keep it or not - it wasn't clear what the article I had marked was about. So I'd click the link, and sometimes find out the article (or the web site itself) no longer existed - or I'd find the article was no longer interesting to me - and I'd hit Delete. Other times, I just needed to rename the bookmark, to make it meaningful to me. This sometimes meant subdividing a bookmarks folder. I did this with my ADHD bookmarks - I had a long list, and it was hard to even remember what I had! Now it's easy to see what I've got. And sometimes it meant combining files. I'd sometimes find - just as we often do with a large collection of paper files - that I had two folders with similar information. Now everything is in one place. Lots of Jewelry? 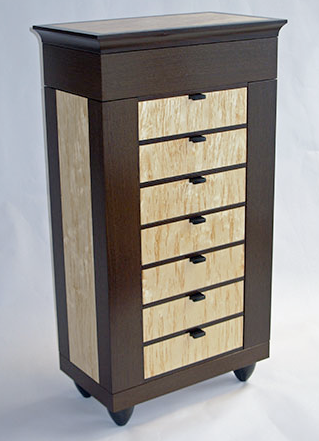 Consider a Jewelry Armoire. If you have a lot of jewelry to store - and you've already determined you do indeed want to keep all the pieces - a jewelry armoire (or jewelry chest) might be just the thing for you. 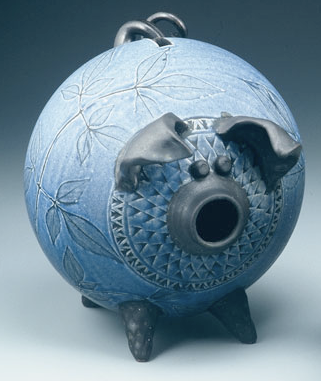 Of course, these pieces call attention to themselves, so you wouldn't want to use one if you're concerned about theft. 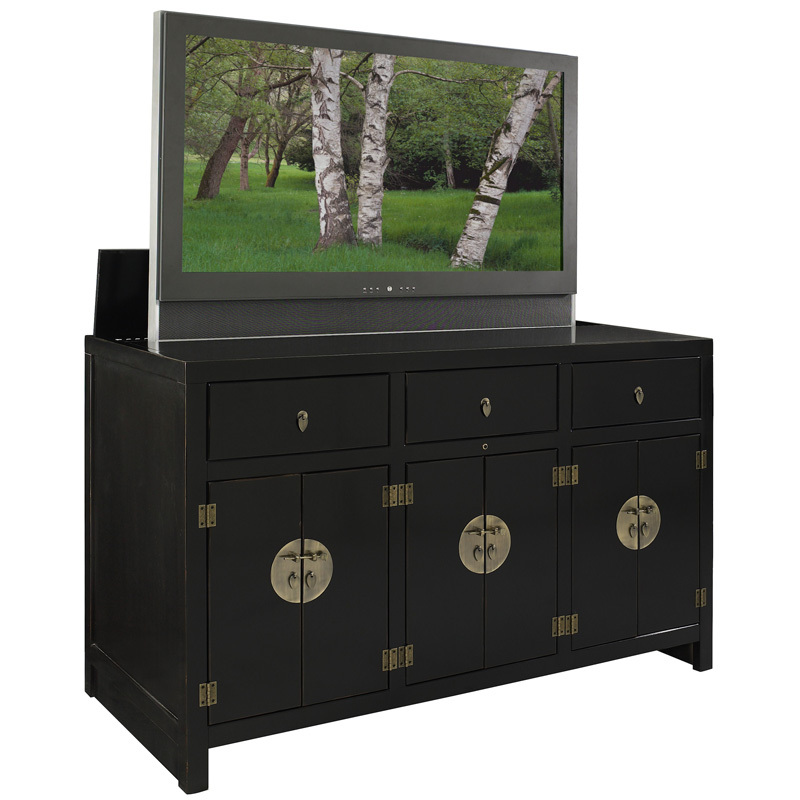 There are many options that aren't too expensive, like the Powell Mission Oak Jewelry Armoire shown above. But let's leave price behind for a minute, and admire some of the beautiful storage options that are out there, created by individual artisans - pieces that are functional works of art. 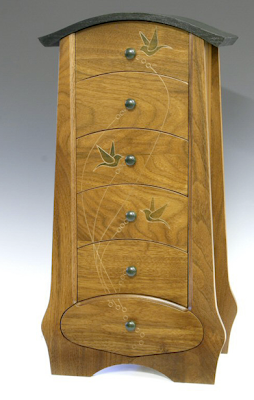 This stunning jewelry cabinet, in ash with walnut accents, comes from Michael Evans Design. 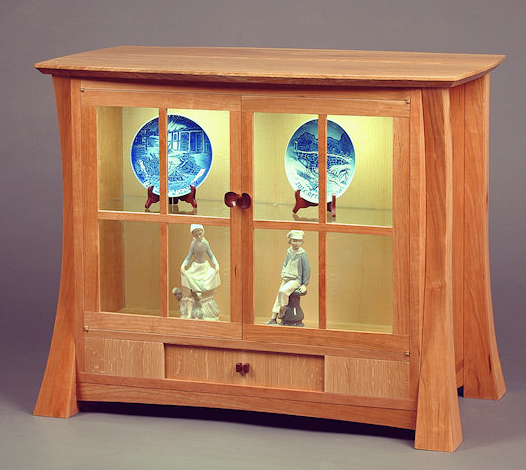 You can also see it at CustomMade - a wonderful site I found from Hardwood Artisans. Update on Nov. 9, 2011: Michael Evans Design doesn't seem to have its own web site any more. Cyma Furniture Design has this marvelous jewelry armoire, made with wenge and birch burl. And finally, Dream Mountain Studio has the most amazing jewelry chests and cabinets - it was hard to pick just one to include! I encourage you to go to the web site and poke around. This one is called Birds in Flight. 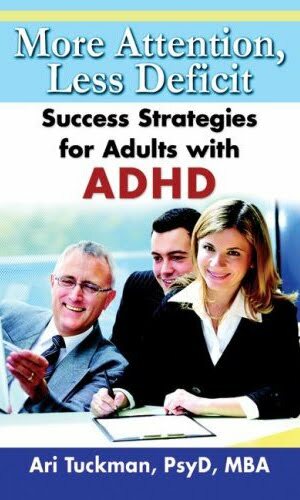 Books on ADHD abound - but More Attention, Less Deficit is one of the best I've seen for adults (rather than children) with ADHD, and the other people in their lives. The National Study Group on Chronic Disorganization pointed me to this book, and I'm very glad about that. Update on May 30, 2011: The National Study Group on Chronic Disorganization is now the Institute for Challenging Disorganization. I dislike the book's cover - the photo looks like those pictures you seen in tons of bad PowerPoint presentations - but that's the only thing I disliked! - How it affects adults' lives. - How to get diagnosed. - Meds that can help. - People who can help: therapists, coaches, professional organizers. - Building the skills to do better at time management, organization, etc. - Dealing with specific situations: work, college, family and more. 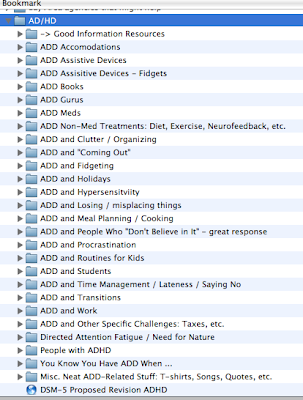 Because I've already studied ADHD a lot, and worked with clients who have ADHD, there weren't too many things in here that were new to me. But I found myself highlighting all over the place, as I found points I wanted to remember, and especially nice ways of wording things. I liked the author's tone, too. He's compassionate, but also expects each of us to take responsibility for improving our own lives - with appropriate help. He's never preachy. He focuses on presenting information that is backed up by reputable research studies, but he doesn't bore you with the details of those studies. (He does point you to them, so you can go investigate more if you so desire.) There's also a sly little sense of humor that pops up every once in a while. And I like his approach to tools: "I'm all about using the simplest tool to get the job done." Finally, I'm very thankful for the pointer to the Job Accommodation Network web site, with its wonderful list of accommodation ideas for those with ADHD. I got the following organizing success story in an e-mail from a long-term reader, and he gave me permission to share it with all of you. I moved from a two-story house with a basement to a one-story house without a basement. Like most people, my wife and I cleaned out quite a bit before moving. And then we were shocked with how much we still "needed." We had nowhere to store these "important" things: seasonal decorations, toys for when grandkids visit, photo albums, etc. 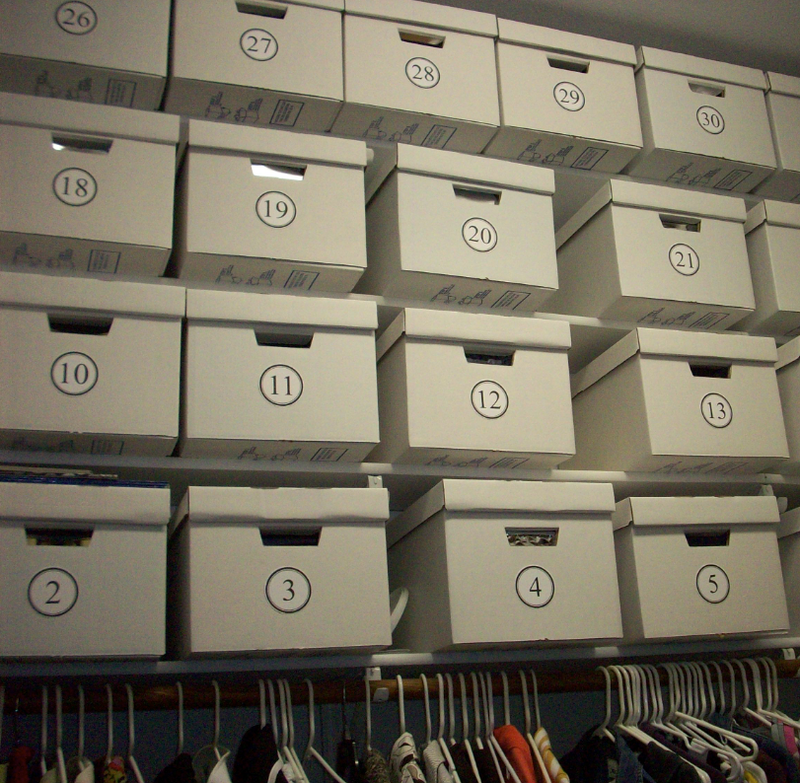 My house has 11-foot ceilings, so I had a lot of unused wall space in my closet. I built some shelves and bought some white bankers boxes from The Container Store (they're much cheaper when you buy 50 at a time) and started filling them. I found it easiest to number the boxes, and enter everything in a spreadsheet on the computer. That way I can look things up by item, category, or by box. It seemed much easier than labeling everything I had on the outside of each box, and made it much quicker finding things. I printed the sheets and have them hanging on a clipboard by the boxes. July/August 2010 Organizing Tips and More: Photo Organizing, etc. My July/August 2010 newsletter is now available.